In rare cases, the endometrial tissue tends to advances beyond the pelvic organs. The dislocated endometrial tissue usually gets thickens and often breaks down with each menstrual cycle. This causes heavy bleeding during the menstrual period, and at other times of the menstrual cycle. The displaced tissue does not have a way out of the body naturally and eventually, it gets trapped inside the system. In case the endometriosis includes the ovaries, there are greater chances of cysts formation known as endometriomas. The tissues around this area become irritated due to such cyst formation. It gradually develops tissue and adhesions. Abnormal bands of fibrous tissue stick the pelvic tissues and the organs to one other. Endometriosis causes mild to severe pain to the woman. The severity of the pain increases especially during her periods. This also results in fertility problems. However, there are effective treatments available for such syndrome that can properly cure the roots of it. Treatment for endometriosis is either medication or surgery. It depends on the doctor to choose your treatment procedure based on the severity of your signs and symptoms. The doctor usually recommends over-the-counter pain reliever medicines like naproxen (Aleve, others) or nonsteroidal anti-inflammatory drugs (NSAIDs) ibuprofen (Advil, Motrin IB, others). These medications are given to ease painful menstrual cramps. Supplemental hormones are introduced to reduce the pain of endometriosis. Some patients get complete relief from the pain due to such hormonal therapies. However, no Hormone therapy is a permanent solution to endometriosis. Patients reportedly experience pain again as they stop the treatment. Laparoscopic Surgery for Endometriosis is the most applied procedure to diagnose and eliminate mild to moderate endometrial tissue from outside the uterus. Instead of making a large abdominal incision, the gynecologic surgeon chooses to insert a laparoscope (a lighted viewing instrument) through a small incision. The surgeon can make one or more than one incisions for better access and to insert other surgical instruments. The added advantage of endometriosis laparoscopy is that the diagnosis can be confirmed and treated at the same time. The procedure promptly finds out the position of and size of endometriosis. The sample of endometriosis tissue seen during the laparoscopy is usually taken and sent for biopsy to ascertain the malignancy. The treatment of endometriosis depends on its location and size. Spots of endometriosis found throughout the pelvis are surgically removed or by burning procedure that uses diathermy or laser. Endometriosis found in the ovaries is usually present in the form of cysts known as endometriosis cyst (endometrioma) that needs to be removed by laparoscopy surgery. As per studies, it is found out that up to 70 percent of women do not have any evidence of endometriosis returning to them after five years of their surgical removal. All endometriosis cannot be treated with laparoscopy. 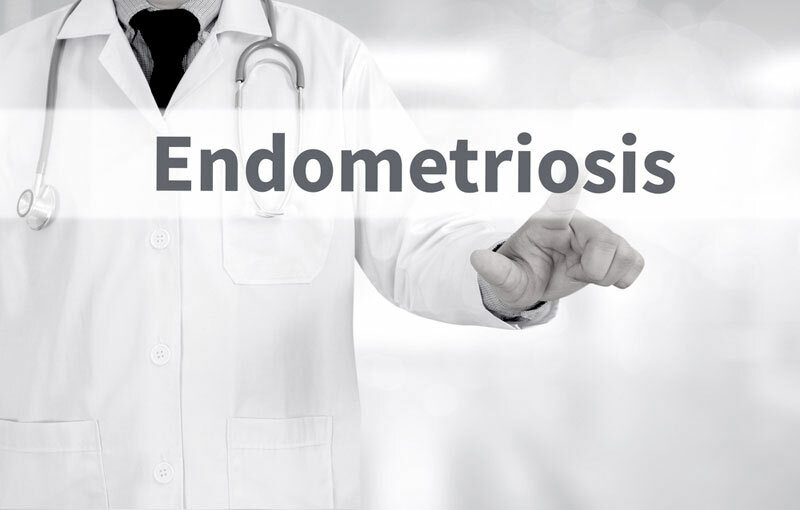 In a few cases, endometriosis affects organs like the bowel or ureter (the connecting tube from kidney to the bladder). In such cases, further surgery is required at a later date involving other specialist surgeons. Laparoscopy is the best diagnosis to determine the presence of endometriosis. Endometriosis can also be felt on vaginal examination. Endometriosis cyst can also be seen on the ultrasound scan. A regular vaginal examination or scan includes diagnosis of endometriosis. Blood tests might be conducted to measure protein and CA 125. However, the raised level of protein and CA 125 is not always due to the occurrence of endometriosis. This raise causes irritation or inflammation in the organs of the female reproductive system that can either be due to endometriosis or appendicitis. It can also happen because of pelvic infection and ovarian cysts. Laparoscopic surgery is the only surgical procedure to treat endometriosis. It turns a major operation into a minor one. It gives you smaller cuts on the abdomen and a shorter recovery time in comparison to a bikini line cut (laparotomy). Laparoscopic surgery, however, may not be suitable for everyone. Drugs combined with surgery before and after may be helpful for women as a part of the pain management strategy. The patient is advised to not eat or drink minimum at least 8 hours before the laparoscopy. Laparoscopy for endometriosis is mostly executed under general anesthesia. However, the patient can stay awake if the local or spinal anesthetic is applied. The procedure is performed by a gynecologist or a surgeon. During the laparoscopy procedure, the abdomen is expanded by filling carbon dioxide or nitrous oxide gas introduced with a needle. It pushes the abdominal wall at a distance from the organs and makes it easy for the surgeon to see them clearly. A laparoscope is next inserted by the surgeon through a small incision to examine the internal organs. Further incisions may be made to insert ancillary instruments to move the internal structures and other organs of the reproductive system for better viewing. This procedure is performed usually within 30 to 45 minutes. Once the procedure is over, the surgeon stitches the abdominal incisions to close them. Generally, there is almost no or little scarring. The procedure of endometriosis laparoscopy involves removal of the endometrial patches and the scar tissues as they contribute to endometriosis pain in females. The primary objective of this laparoscopy procedure is to help patients to avoid open surgery and treat endometriosis without any harm to the other healthy tissues. This surgery is proven to be effective in females experiencing a re-growth of endometriosis tissue. It has also been proven more effective in women suffering from moderate endometriosis, than minimal endometriosis.